Since launching in 2014, Sydney-based Interior Architects Tom Mark Henry have completed an impressive 75 projects across residential, commercial, retail, hospitality and the work place. Founded by Cushla McFadden and Jade Nottage whose extensive knowledge, experience and creativity underpins their diverse and talented team, the Tom Mark Henry studio seeks to deliver an element of the unexpected. Beautiful spaces that foster a full sensory experience with many refined layers, this is demonstrated in their recently completed residential project Darlinghurst Terrace. 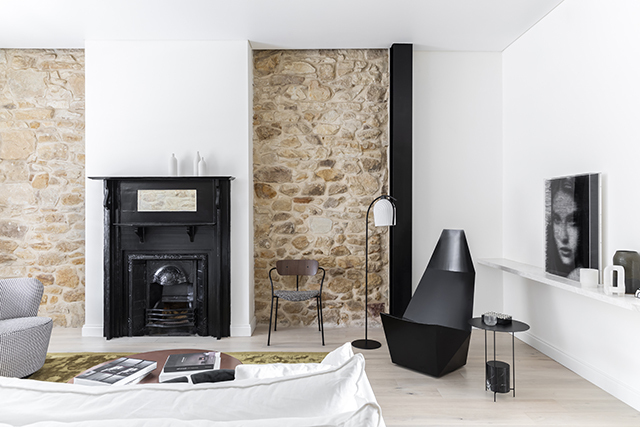 Pared back to its original features, the former run down three-storey terrace has been filled with minimalist design and injected with contemporary details. Although a significant intervention was needed to make the terrace habitable, particular care was taken to retain the original character of the building. The approach was to create a more functional floor plan, and pull natural light through the space. With a focus on the interplay of texture, the design team combined hard and soft finishes, contrasting matt and gloss surfaces, and light and dark to create intrigue and depth in an otherwise monochromatic palette. Describing these quiet juxtapositions as an exercise in restraint, with the goal to achieve balance and simplicity, I think they have more than delivered!